I’ve finally finished the kit I mentioned earlier. 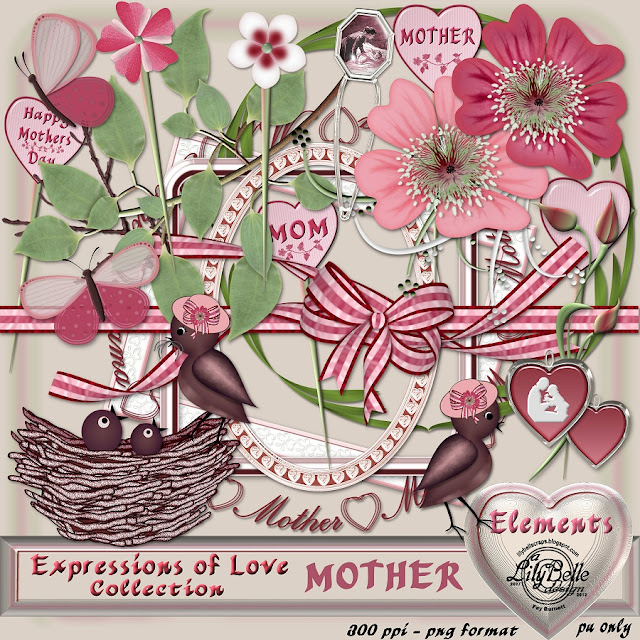 It is part of a collection of kits called EXPRESSIONS OF LOVE. This first kit in the collection is called MOTHER and, although Mothers’ Day is obviously the theme, there are plenty of papers and elements that are suitable for scrapping other happenings and events. It is available now in my Ivy Scraps shop. As usual I have made several freebies, 2 available now in the Ivy Scraps store, 1 which will be available in the Ivy Scraps May 15th newsletter, and 1 (for now, there may be more) available here on LilyBelle Scraps at the end of this post. Thank you so much for the lovely freebies from this wonderful kit. myscrapbook says; Beautiful. Thanks for the gift. Freebies are always very much appreciated.